The 2010 Dodge Challenger is one of a number of revised muscle cars on the market now, but one could say it’s the most distinct looking of the bunch. There’s no doubt about it – it’s a car that gets a lot of looks. The throwback styling combined with wide fenders and that horizontal, cutout grille makes for one heck of an eye-catcher to say the least, but it’s the rumble of the R/T’s 5.7-liter Hemi that causes heads to turn in the first place. The loud, powerful engine delivers a solid punch that can elicit a giggle from even the most serious occupant, and the whole package is outrageous enough to create even more fans for this storied model. Not everything about this car is great though, and it takes a real believer in the Challenger name to disregard issues like the poor interior styling and lack of quality tech features. The car is also enormous, which means those living in urban environments may harbor some animosity toward Mini Cooper owners when looking for parking. And then there’s the matter of the SRT8. 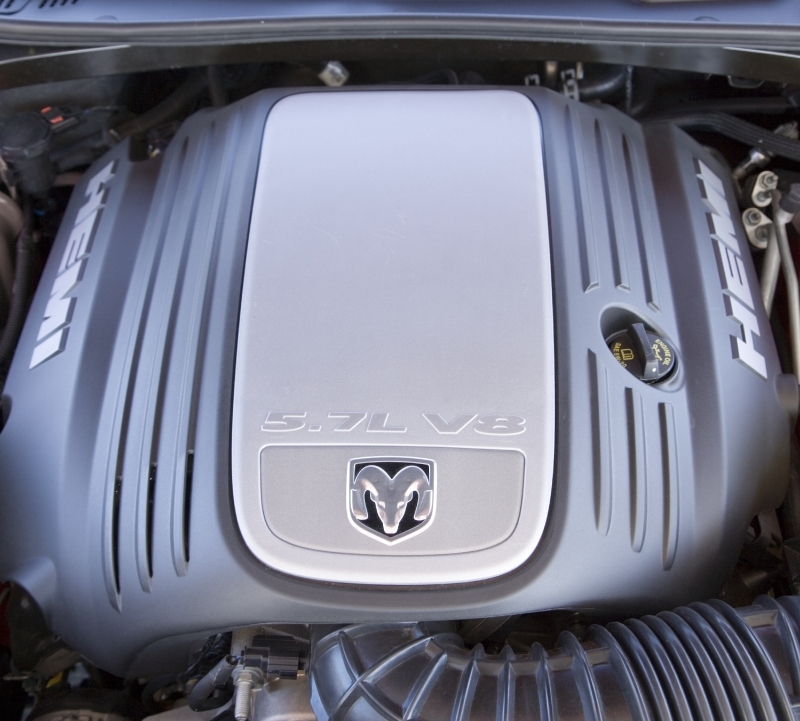 Do you buy the top of the line Challenger with the even bigger engine for an extra $12,000 over the R/T? Not unless you’re crazy. For just a hair over $30,000, you can find plenty of power and plenty of fun in the R/T. Styling, first and foremost, is eye-catching and probably the true reason behind the allure of the Challenger. The folks at Dodge managed to bring the car into the 21st century without sacrificing what was most appealing about the original. Though, for us, it’s all about the Hemi engine and its rumbly 372 horsepower. 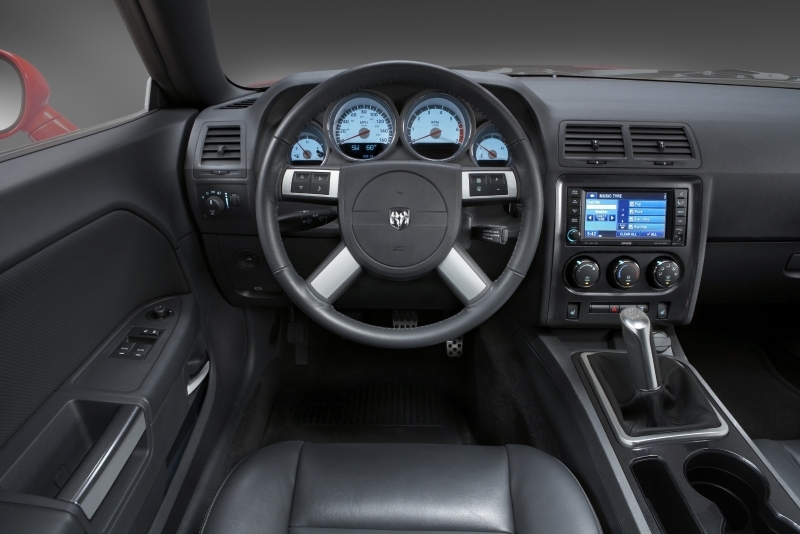 Dodge isn’t known for classy interiors, and the Challenger R/T falls short in terms of quality materials and ergonomics. Rear space is expectedly tight and won’t fit adults very comfortably. Poor visibility from, well, everywhere coupled with a long body makes the car difficult to maneuver in heavy traffic and urban areas. Opting for the R/T trim outfits the Challenger with a 5.7-liter Hemi V-8, which generates enough power to bring this 4,000 pound-plus car to 60 mph in just 5.1 seconds. It’s fast and fun around town and on highways, just as you’d expect. Also not entirely unexpected is the poor handling in corners and through switchbacks; this is a big car and one tuned to deliver straight-line performance over tight cornering. It’s a bit of a disappointment when comparing it to the more lithe competition, but not if a muscle car cruiser is what you’re looking for. Our Challenger was fitted with the six-speed manual transmission and oddly enough, it’s a $995 option – a five-speed automatic comes standard. For this car however, the manual’s really the coolest way to go, with its short throws and pistol grip shifter, but it’s a little sloppy and the long clutch pedal travel and foot-operated parking brake can take getting used to. Still, it’s a comfortable ride, and an easy car to drive despite its obvious size. 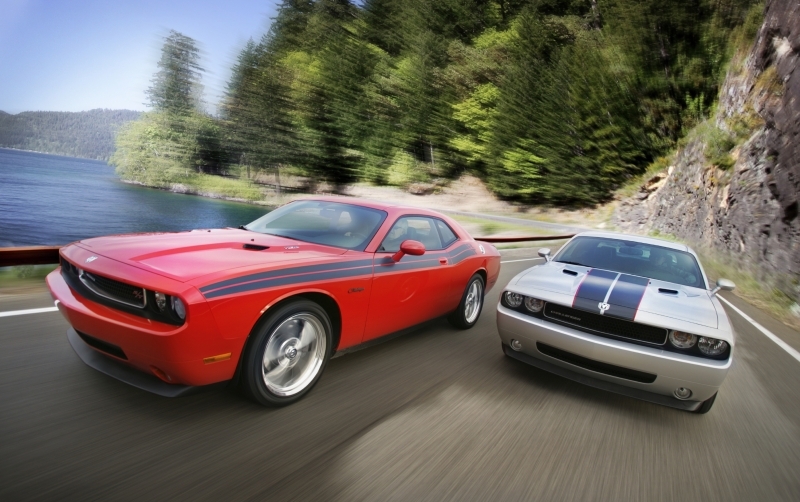 The rear-wheel drive Challenger R/T is powered by a 5.7-liter Hemi V-8 with 372 horsepower and 400 lb-ft of torque. A five-speed automatic transmission comes standard, but a six-speed manual can replace it for an extra $995. Dodge’s choice to include a foot-operated parking brake seems like an odd choice for those who nab the manual transmission, but the inclusion of hill start assist as standard helps. It holds the car for a few seconds without you having to step on the brake so you can head up those 25% grades without fear of rolling backwards. Dodge’s UConnect system – an option on the R/T – uses a touchscreen interface to connect you to audio, navigation and system settings. Through it, you’ll find the rest of the tech features in the Challenger, including Bluetooth connectivity and a USB port. Green Evaluation/Gas Mileage Considering the weight the Challenger swings about, the car actually returns pretty decent fuel economy. At 16 mpg city and 25 mpg highway, the R/T won’t hurt too badly at the pump. There’s a huge trunk and plenty of tech goodies on-hand, including a USB port and Bluetooth connectivity if you spring for a $1,165 package. The interior itself is pretty basic with lots of hard plastic surfaces. Still, it’s not a bad place from which to watch the world go by and if you want, you can option out some leather trimmed bucket seats with seat heaters for some added comfort. One of the highlights of this car, the Challenger’s exterior instantly strikes a strong image. The slim, long nose and wide rear fenders give it a menacing look, though it’s definitely a more bloated version of the original. 18-inch wheels meet the ground, but 20-inch items are available as an option. As far as the Challenger lineup goes, the R/T presents the most bang for the buck, with a good balance of power and frugality at $30,860. Of course, the new generation of muscle cars is equally well priced. The Ford Mustang GT starts at $29,645 and the Chevrolet Camaro 1SS begins at $30,945. Dodge’s own Charger R/T Plus is just slightly higher at $32,345. 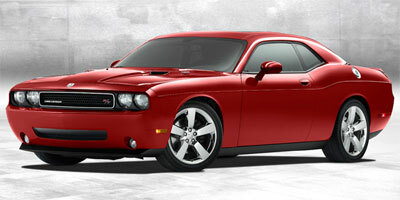 The Challenger is a car for a very specific type of audience and many die-hard fans will want to buy the SRT8. But why bother? Sure you get the massive 6.1-liter Hemi, but it doesn’t add that much more power to warrant the extra 12 grand on top of the RT’s price of $30,860, and it still has that classic muscle car look and feel.